We developed an innovative electronic visual control board for the Devon Partnership Trust. The concept of ‘MyWard’ is to provide simple visual clues and prompts for improving quality and safety of care. This system was developed in collaboration with multi-disciplinary clinical and managerial staff. MyWard removes the administrative burden and enables clinical staff to spend more time on direct patient care. It is also an at-a-glance visual storyboard for staff to get a clear picture of the ward, without having to look through multiple systems! This is a national first for Mental Health. Innovation and implantation of such technology to improve patient care shows that the Trust are leading the way in bringing bed management technology into Mental Health services and advocating parity of esteem. 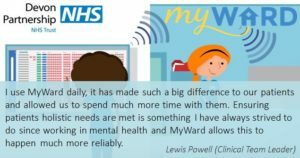 MyWard has helped staff across the wards, from reducing admin time to finding patient care information quickly and easily. Care is delivered in a timely manner, reducing confusions, and handover between ward rounds is much quicker and easier. This is a prime example of making better use of technology to facilitate timely intervention and to ensure quality of care. Admin time has been cut by 63% per task and staff can spend more time with patients for direct patient care. 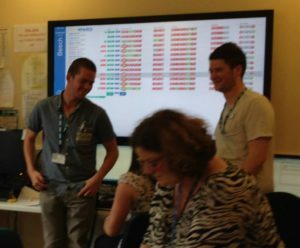 The electronic visual control board (MyWard) enables more efficient control of resources resulting in delivery of high quality and consistent care for patients. At the Tech4Good awards in London, 2016, MyWard won the Digital Health Award. The judges found that MyWard enables consistency of care and could be scalable to other health service areas to make improvements and deliver safe and effective clinical services. That’s all very well, but what does MyWard actually DO? MyWard shows the patients on a ward and the checks they have had done or need. The Patient block shows information about the patient. The type of checks, the grouping and the re-check times are configurable for the Trust, the Specialty or even each individual Ward. To see what the Indicator icons mean, press the Map button. When you have completed a Check, tap the relevant icon. Most checks have to be re-done after a set number of hours (e.g. 24 or 168). However others can have a re-check time set by the clinician. MyWard links to the Trust corporate systems. 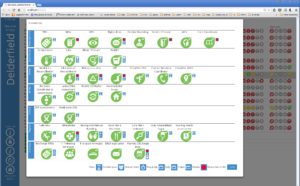 DPT have recently moved from RiO to CareNotes: MyWard can be set up to integrate with either. If you want to see some of the Care Notes information for the patient, tap the patient name twice. When a patient is admitted or discharged, MyWard will read this from RiO or Care Notes. 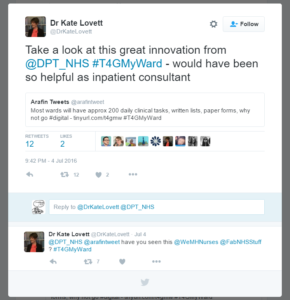 However at DPT the Care Notes data is only downloaded once per day. Because of this, MyWard lets you admit or discharge patients so the information is always up-to-date. You can also send patients on leave.